We were back on the river this week for the rescheduled V.E.S. 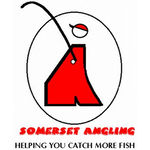 match and I was hoping I might finally draw a peg at Isle Brewers or Redbridge but with fifteen anglers booked in for this one, Rob had to put some pegs in at Upper and Lower Coxes. After we’d all finished eating breakfast and paid our pools, it was nearly time to draw but before we did, Rob announced there would be a slight tweak to the pay out and instead of paying out the top three and two sections, the top two in each section would pick up. A really good idea because, with the river low and clear, it would give the anglers at Coxes something to fish for because at the moment it just can’t compete with the lower end. 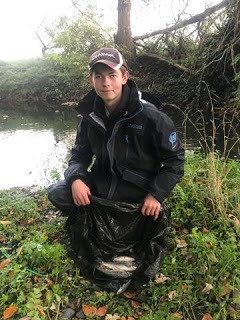 By the time I reached the bucket, there was just one peg left, I pulled it out and when I looked I could see the numbers 2 and 9 and was desperately looking for the number 1 that should be in front but it wasn’t there and for the third match on the trot I was at Coxes. Peg 29 (The Stump swim), used to be a flyer but in recent times it’s been a real struggle, I drew it last year and managed one minnow off it! To be fair, two good fish rolled at the bottom of the peg that day, so there are some in there. Bill and Karl who’d drawn 27 and 28 respectively wanted to follow me to the river so we headed off in convoy, we parked up and I showed Bill where his peg was before starting to unload my gear. Hurf, who was on peg 15, phoned to check if we were still having a pound on it and I said yes because I expected us both to struggle. He also said that pegs 108 and 110 at Redbridge were in our section which meant we were up against it a bit, if it was just a section at Coxes, it would have been fair, very hard, but fair. I was sure one of those two pegs would win the section but it’s very rare for both swims to produce so there was still a possibility of a pick up. I do think it’s a great idea and it reminds me of when Chard did the same when they were using the Donyatt and Horlicks stretches. I walked down to my peg and it looked nice but it always does, I sat a little lower than I did when I had it last year. I set up a 1 gram bodied float with an olivette and two droppers and plumbed up, there was a nice depth across where all the flow was with a slightly deeper run to my right. I also set up a 0.6 gram DH16 with a spread bulk to run through and give me a different option. On the side tray I had maggots, casters and Bait-Tech Super Seed hemp. The start time arrived and I fed some casters and hemp across and also fired a few casters down the peg, I shipped out the heavier rig with two red maggots on the B611 size 18 hook and after two missed bites, I caught a tiny minnow to avoid the blank so on went a caster to see if there were any proper fish about. I rig settled and just as I went to feed some more bait downstream, the float sailed away and the strike resulted in a fish pulling a little bit of elastic out. I swung in a little chublet and when I had another next chuck, I was off to a promising start. 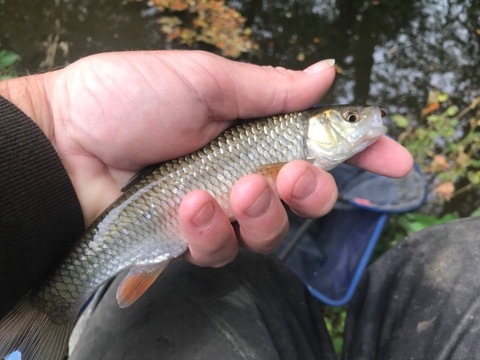 I took a section off to fish at ten metres in the flow to see if I could catch closer and had a few small dace and it felt like there were a few fish in the swim. I did bump a fish and missed a few bites, back across to the far bank and I had a lovely dace and was really enjoying myself. 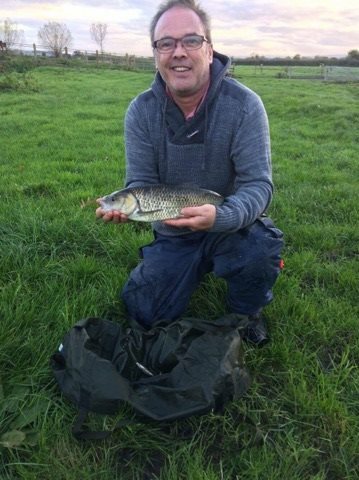 After an hour I had eleven fish for around 2lb but felt sure sport would tail off. The second hour was steady and I added another eight fish to put me up to 3.5lb although I did lose a fish shipping back and also had a better chublet dive into some vegetation under my feet and transfer my hook to some weed! Then the sun came out which I knew wouldn’t do me any favours and I only added a couple of fish although one was a really nice dace of 8oz or so. 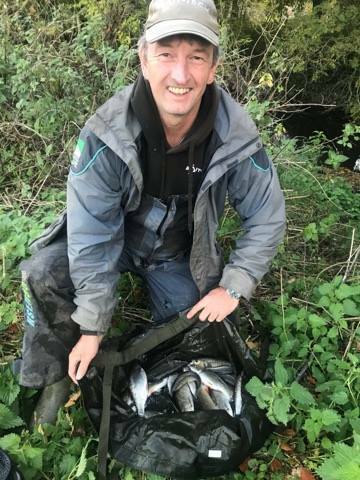 Karl appeared behind me and said he was really struggling and only had a couple of dace although he had lost a decent trout at the net (I wonder if that was the same one I lost the other week! ), he also reported that Bill had only caught a couple of chublets. I did miss a bite while he was there but after a great start, the swim had died. 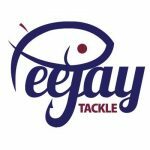 I went thirteen metres down the peg and held the rig back against the cover, a positive bite saw me swing in a 2oz chublet and I then had a nice little run of three or four fish before bites tailed off again. I went back across and had a nice dace and it was a case of nicking a fish from each swim, I had my best fish, a chublet about 10-12oz from down the peg and was hoping a few bigger specimens might show in the last hour but if anything the bites just fizzled out. 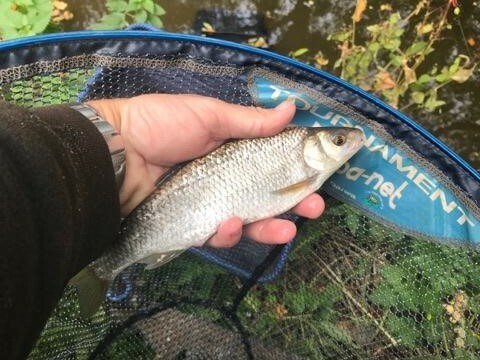 I’d really enjoyed myself today and ended up with 31 dace and chublets plus a couple of minnows and thought I had between 4-5lb. I’d just about finished packing up when Karl arrived with the scales, the needle pulled round to 5lb 10oz which I was pleased with. 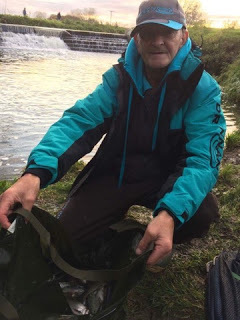 He very kindly helped me back with my kit before we weighed Bill in, he’d struggled for 12oz, Karl was next and he’d caught some nice dace to weigh 2lb 12oz and wouldn’t have been far off my weight if he’d landed that trout. 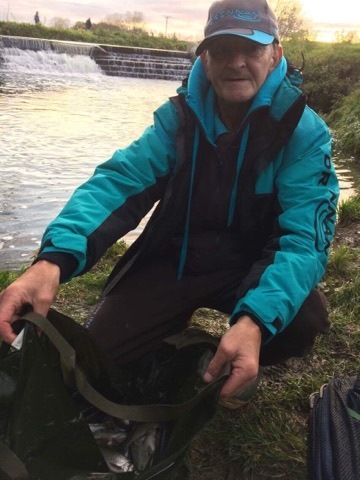 We then headed to Upper Coxes and it had been really hard there, Paul Homewood had the top weight with just 1lb 12oz from peg 22a followed by Tony Newman with 1lb 1oz from 14 and Hurf had 14oz from 15 so at least I’d won a pound off him although I fully expected to have to give it to Steve P who was on 120 today. 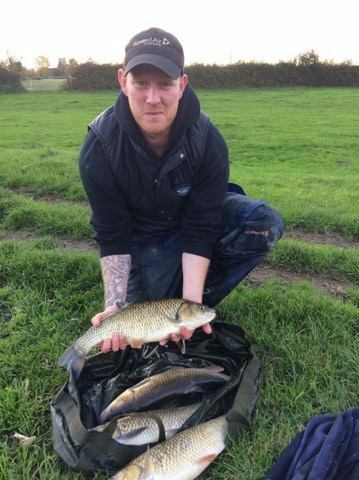 The rest of Isle Brewers had fished pretty well with Adie weighing 7lb from 128, Rob had 5lb 10oz from 128a (and had lost three chub), Stu had 2lb 8oz from 125 and John didn’t weigh from 124. Looking at the results, the new pay out worked pretty well although the same five people would have picked up under the old system, the only differences being Frank probably took home a little less, Leighton had a little more and I had £40 instead of the £15-£20 I would have had for a default section win so yay for the new system!, joking aside, if you look at total weights for the top section of eight pegs (33lb 2oz) compared to the seven pegs of the bottom section (53lb 11oz), there’s no comparison and that’s with a DNW at Isle Brewers and if you take away Leighton’s weight, the top section drops to 15lb 14oz! I think both pay out systems have their uses depending on the pegs and areas used, it’s just a case of trying to give everyone a chance, fair play to Rob and Steve for trying something a bit different. 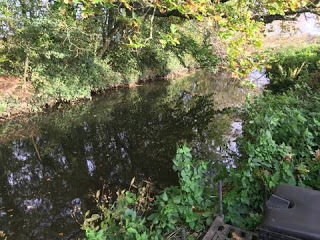 I still think there’s lots of fish at Coxes but we need the right conditions, at the moment the river is just painfully low and clear. Next week, with Rob and Hurf away on their holidays (not together I hasten to add! ), it’s down to me and Steve P to organise the match (God help us all! ).